Sleeping Queens is a card game for between 2 – 5 players released by Gamewright and designed by Miranda Evarts. In Sleeping Queens, players have to wake up Queens who are currently in a long slumber using a variety of different cards. The first player to wake up the required number of queens (dependent on how many people are playing) or score the required number of points, Wins. In the middle of the table, there are 12 queen cards laid faced down. Each Queen has a different name and picture. Some are worth more points than others. On a turn, a player plays a card onto the table. There a number of cards and options that they can do. Some of the cards they have in their hands are action cards, and have different effects. If a player plays a King card, then they can wake up one of the queen in the centre of the table. If they play a Knight card, then they can steal a queen from another player, however, if that player has a Dragon card, they can play that dragon to prevent the knight from stealing the queen. If a player has a Sleeping Potion card, then they can put another players Queen back to sleep, unless that player however has a Magical Wand card, which prevents the potion from taking effect. In the pack there are also some Number cards. These don’t have much of an effect other than allowing players to get rid of them to draw more and hopefully better cards. Players can discard these number cards in one of 3 ways. One, they can just discard a single number card. Two, they can discard two number cards of the same number. Three, they can sell 3 cards that make up an addition equation, so for instance they can discard a 2, 5 and a 7 because 2+5=7. Once the number of cards have been discarded (so 1, 2 or 3 cards) the player then immediately picks up that many cards. There is also another card of mention, the Jester card. Jester’s work like chance cards. Basically, a player can play a Jester into the playing area, doing this they immediately draw a new card. If that card is an action card, then the player keeps that card and has another go. If however the card is a number card, then starting from themselves, the player counts each player around the table the number of times it says on the card. The player that the final number lands on immediately gets to wake up a queen. At the end of their turn players draw back up to the hand size and play passes round to the next player. As far as the rules of the game goes, that’s it. Although there is some special rules regarding some of the other Queen’s. If a player picks up the Rose Queen, then that player immediately gets to pick up another. The other Queen rule is that there is a Dog Queen and Cat Queen, and much like both cats and dogs, these two don’t like each other, so no player can have both these Queens. But apart from that, that’s the rules, nice and simple. Sleeping Queens is a nice fun little game. It is easy to play, and can be relatively straightforward the first time you play it. It has been nicely created with an assortment of colourful cards with lovely pictures on them. The Kings and Queens themselves have nicely been created too by having not just some generic King or Queen, but have names like Sunflower Queen, Starfish Queen, Bubble-gum King or Turtle King. The number cards too have nice little pictures on as well, maintaining that they are not just numbers, but all cards have their own special little extras. It doesn’t get bogged down neither with lots of little extra rules, it really is a game where you can simply just take your turn and instantly know what to do. Altogether, Sleeping Queens is a nice fun little game. It’s easy to understand, play and has been nicely created to bring as much fun to the table as is possible. Since finishing University a few weeks ago (and while waiting for Graduation in just over a week’s time), I have been trying to do a number of things to keep myself productive and busy. 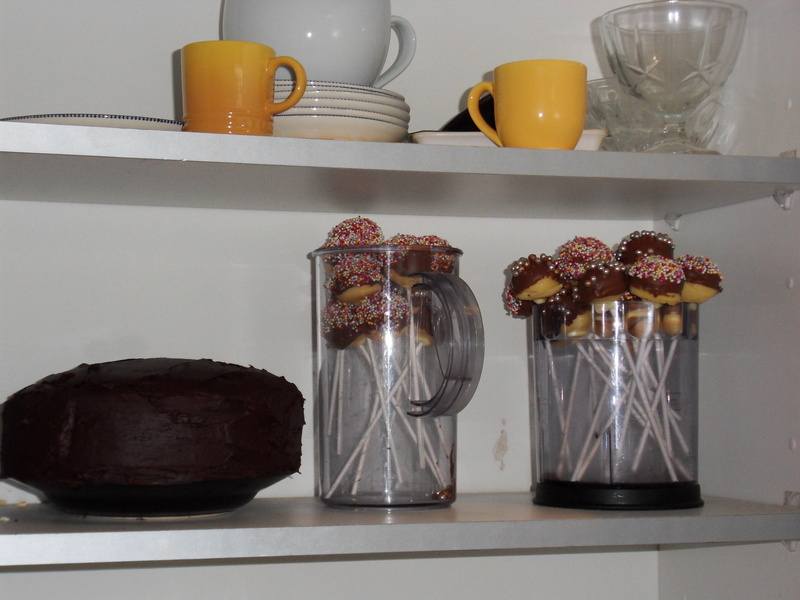 I have been looking for work, trying to come up with a career plan, writing weekly blog posts, coming up with ideas for stories and board games, reading when I can, playing games, baking cakes, volunteering at Barnardo’s and at The Dukes play in the park again. One thing though that I have wanted to continue since finishing, I have found rather hard, and that is writing stories. I like writing stories, I like all kinds of writing, and when I am in the zone, I just can’t stop. Starting is an entirely different matter however. I have kept up with my blog writing, and right now am writing a series of film reviews to be shown in a few weeks’ time, but writing large pieces of work is proving to be rather difficult. Writing big projects at University (in hindsight) was easier, as I was motivated to get the work done as best as I could, but now I need to find new motivation and am finding it hard. I am constantly coming up with ideas for projects, either it be stories, blog posts or board games, but getting round to actually doing them is what I am struggling with. Writing short stories shouldn’t necessarily be too much of a problem as they are small, quick stories to write, however, starting them is as difficult as any other project. Ideas for them are hard as they need to be concise, small, and not necessarily involve big incidents, or big things happening……….which is kind of what I like. Back in May I even came up with a plan to write at least one short story a month, but in June I (technically) did not write one. I say technically; basically, last month I entered Preston’s first Short Story Slam. 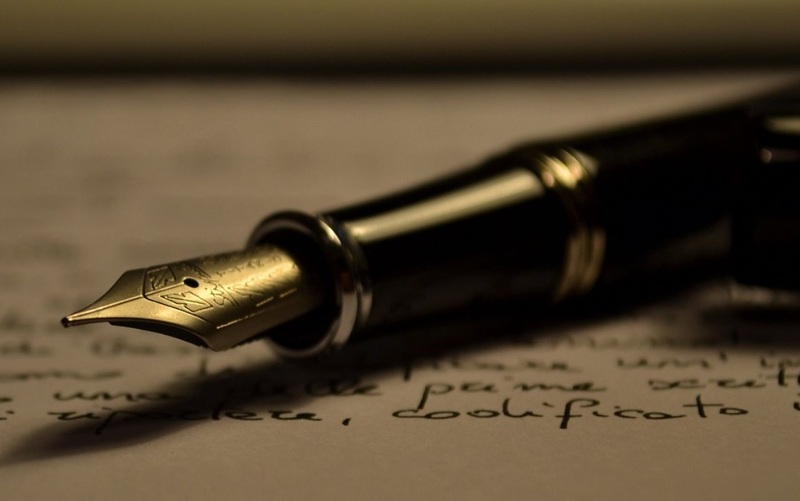 A writing/performing contest where writers write short stories to then read out. Writer’s need to write 3 stories of no more than 200 words that can be read in 4 minutes or less. It’s a head to head sort of thing (as far as I understand it) and I need to write 3 short stories for it. A week ago I wrote one story for it, I still have another 2 to write (at time of writing) but coming up with ideas for such a small word count I am finding tough, and even when I do have an idea, simply sitting down behind my laptop to write it is proving tricky. It was only when I had a voice going through my head telling me to write the first story that I finally did it (The Slam is at the end of July, so I still have some time). Even when it isn’t that though, writing in general (when it is not for my blog) I am finding tough. I can develop ideas quite nicely, (I prefer to do it in my head where I can visualise it, while find that writing it down can usually mean I end up leaving and forgetting about it), but that’s still not writing it. In an attempt to cure what I think is writer’s block; I have started doing little exercises to get me writing again. While my mind wanders onto other ideas of approaching it, for now, this one is working. I have had Rory’s Story Cubes for over a year now. 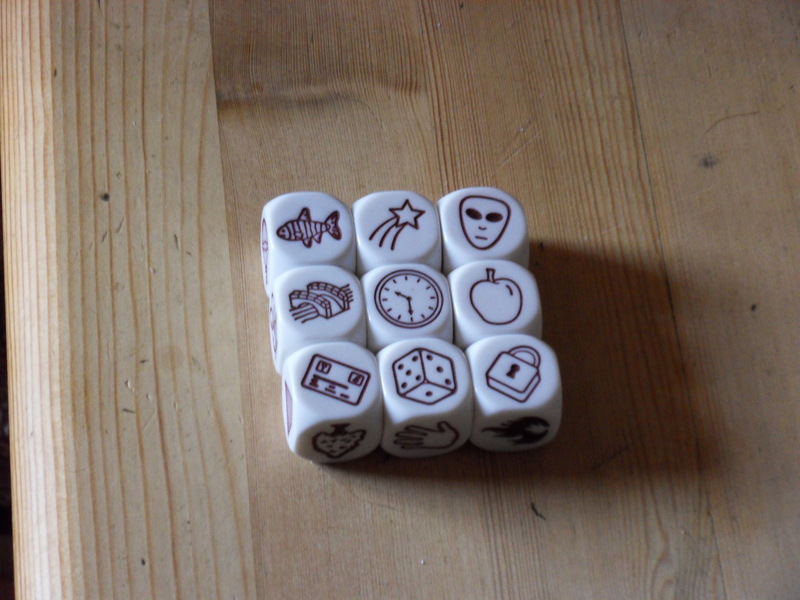 First I got a small expansion in the form of Rory’s Story Cubes: Prehistoria, but discovered using them rather hard, so I bought a copy of the base set, and was able to get going with them. To begin with I just used them as a little game to play with friends and at the Writer’s Society at University. Basically, the base set is a box of 9 dice, with each side on all the dice being a different image (54 images in total). You roll them, and then use the 9 images to make a story. It has to start with “Once Upon A Time” and can either be done as one continuous story as a group, or several stories. There are other versions of the base set and several expansions, all of which can be mixed and matched to create a diverse range of stories. Recently, I decided to use them to help me write some short stories. I use them in the same way as you normally would play with them; roll them and look at the pictures rolled (sometimes re-rolling if I can’t think of anything). Instead of telling the story to someone though, I would instead write my story in a Word Document. 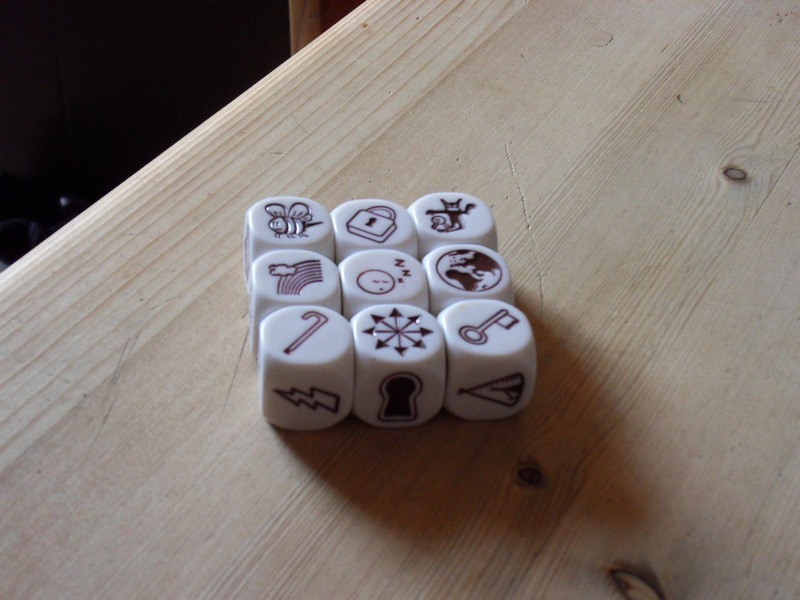 I have been taking the pictures of the images I have rolled, considering possibly putting my stories online at a later date (with a photo of the dice to show what images I have to work with). I actually rather enjoy coming up with stories this way; they can be about anything and there are no restrictions as to the length of the story, nor the genre it is in. It really does help me to get back into writing short stories. While I have not done one for about a week (due to being busy with my current weekly schedule), I look forward to writing another one, and hopefully with time, be able to write some without assistance, possibly even bigger ones. Right now though, I have a Short Story Slam to enter. 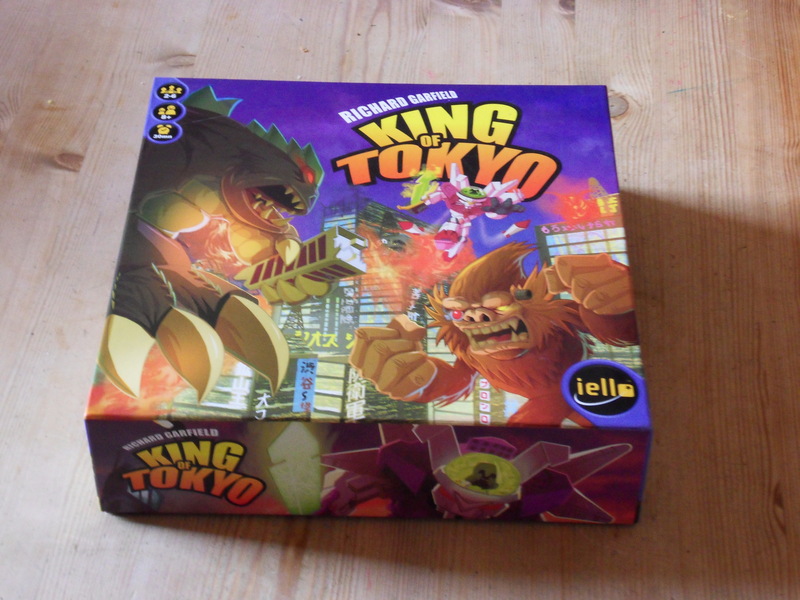 King of Tokyo is a dice rolling game for up to 6 players released by IELLO and designed by Magic: The Gathering creator Richard Garfield. 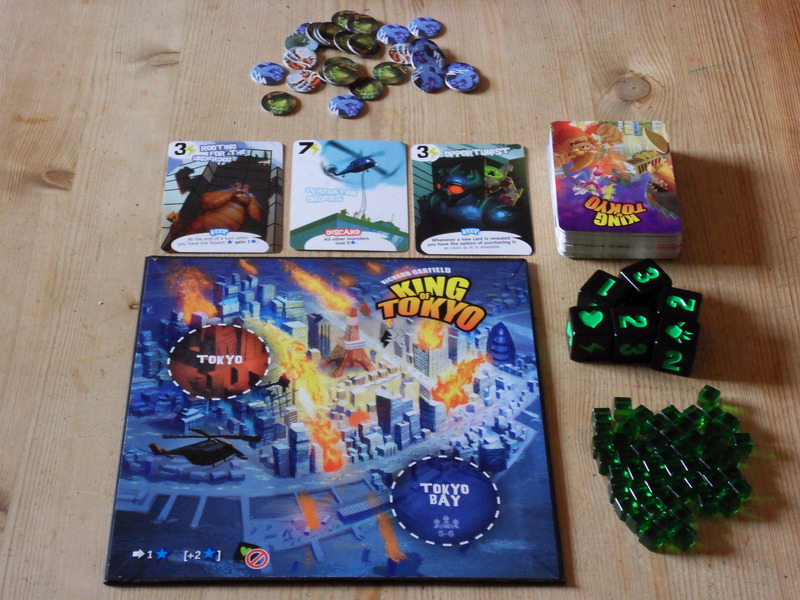 In King of Tokyo, players take on the role of one of several giant monsters (who happen to not look like any other monsters in particular) who are fighting for ultimate control of Movie Monster paradise; Tokyo City. 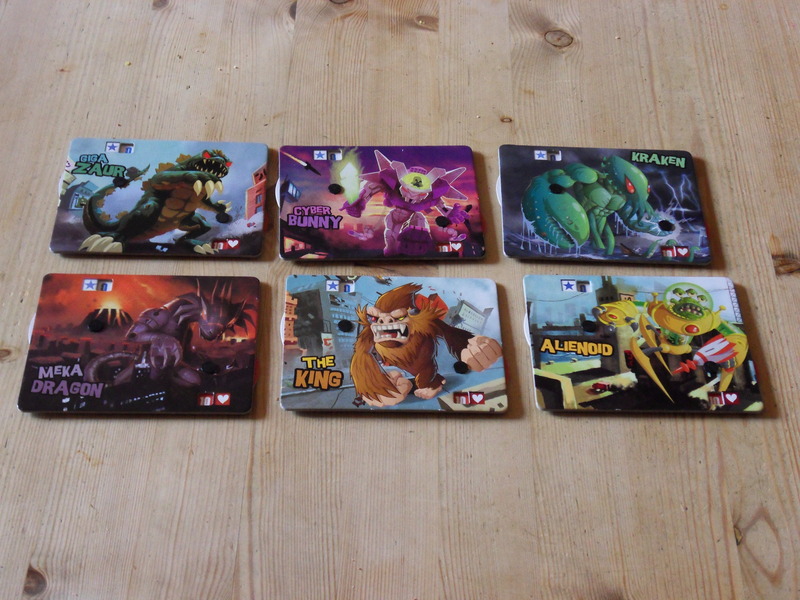 The first monster to reach 20 points, or alternatively, be the only one with any remaining health, wins to become the true king of Tokyo (but not King of the Monsters, that title has already been claimed). The game comes with a large collection of components including a small board, power cards, character cards, character pieces, stands, tokens and little green cubes. 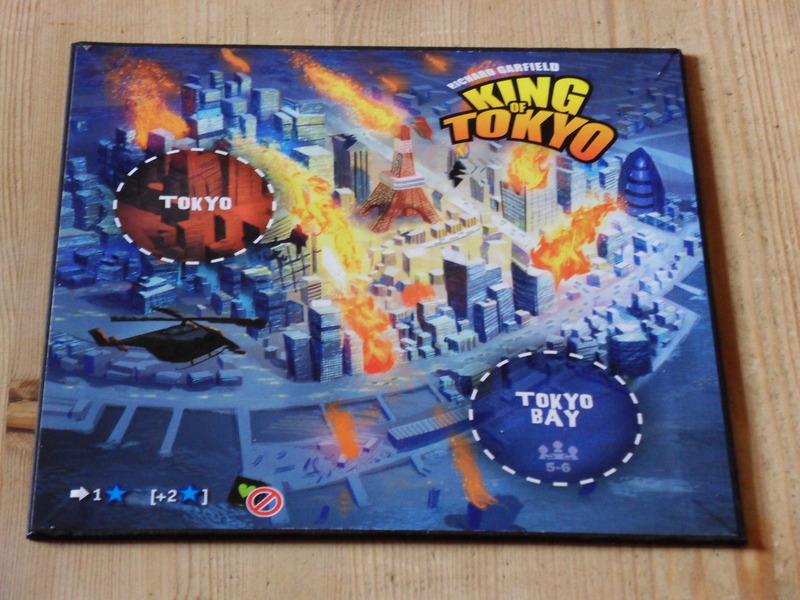 The game is set up with the small board (a picture of Tokyo with the locations Tokyo and Tokyo Bay on it) placed in the middle. 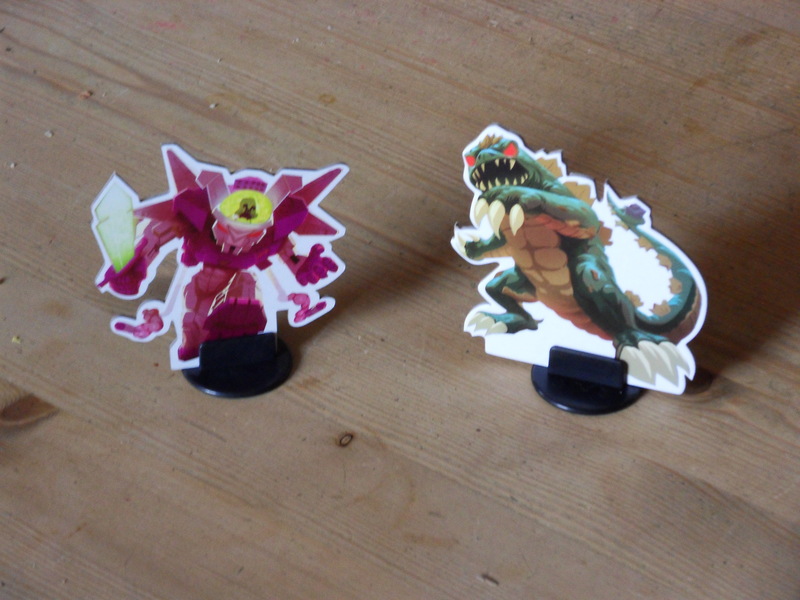 Players then choose which monster they want to be: Giga Zaur, The King, Cyber Bunny, Meka Dragon, Kraken, Alienoid, and take the corresponding character card/board, piece and stand. The character boards themselves have two rotating dials on them. One representing health (starting at 10) and the other representing point score (starting at 0). Players then put their character pieces in the stands and place them near the board. The way the game works is mainly through its dice. 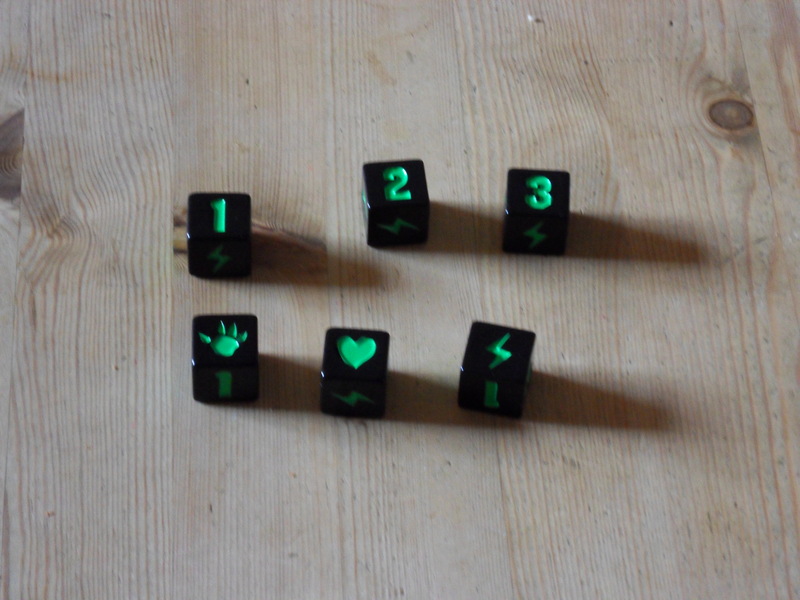 6 black ones with green symbols on them (and 2 extra green ones with black symbols on them). On a players turn, they roll all 6 dice, and compare the results. 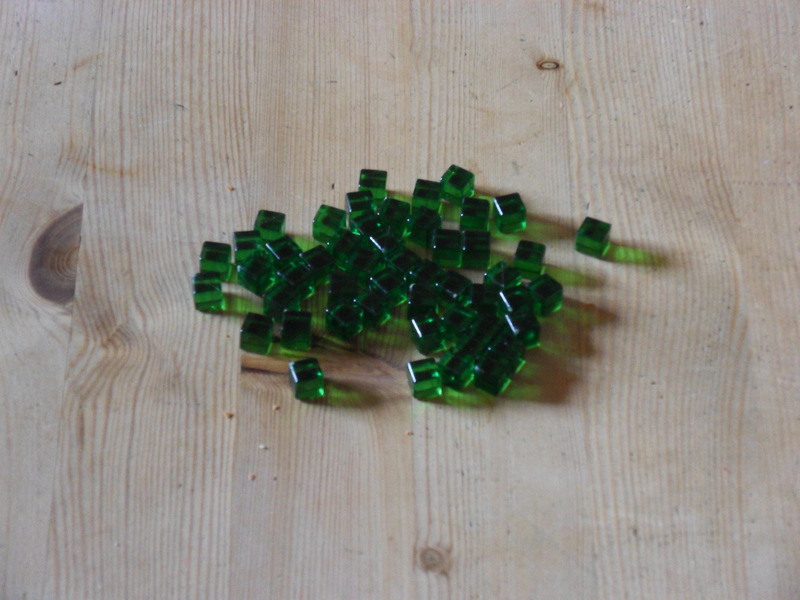 If they want to they can re-roll any number of dice, if still not happy, they can re-roll one more time. After that, they are stuck with what they whether they like them or not. If players roll a claw, this counts for an attack. If a player is the first one to roll a claw, they take Tokyo. If players roll a heart, they can heal themselves. If they roll a lightning bolt, they get some energy. If they roll 3 of any number, they score points equal to that number (so 3 3’s equals 3 points), plus any extra of that number equals one extra (so 4 2’s equals 3 points). Simple right, well yes in theory, but it’s a little bit trickier than that. You see, when a player’s monster is in Tokyo, they can’t heal, so rolling hearts is pretty pointless. Also, when someone is in Tokyo, if they roll a claw or any number of claws, then they deal that much damage to every monster outside of Tokyo, however, monsters not in Tokyo that roll claws, only deal damage to the monster currently in Tokyo; so if you are in Tokyo and are taking too much damage, you might want to yield Tokyo to the monster currently attacking you. If you decide to do so, you still take that damage. Yielding Tokyo though presents another problem. When you take Tokyo you get a point, and every time it comes round to your turn, you get an additional 2 points if you are still there. So players (or monsters) will have to decide when they have taken enough damage to yield or to hold Tokyo for a bit longer to attain more points. Monsters though do have options and opportunities. When a player rolls a lightning bolt they get a little green cube. These can they be used to buy power cards. Power cards have special abilities, some more complicated than others which can help you, or hinder you if someone else buys them. Some cards are permanent, while others are one use only. These power cards range from things like dealing additional damage, poisoning, growing an extra head, getting bigger, get bonus health, reduce other player’s points, coming back to life and deciding to become an omnivore. Alternatively, players have the option to spend 2 energy to wipe out the current selection of three cards to reveal three new ones and then choose from them. King of Tokyo is a nicely designed game. 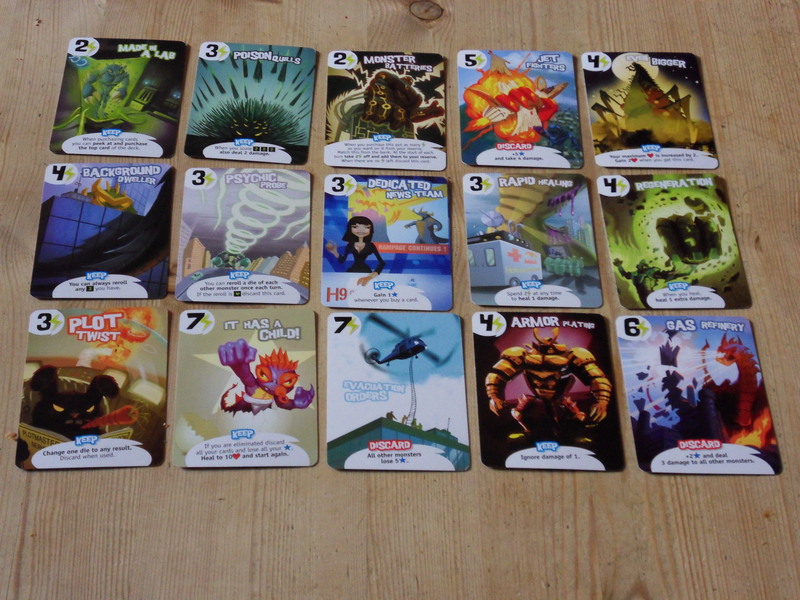 The monster character cards deliver a nice way to keep both score and keep an eye on the health statistics. The use of dials is also more aesthetically pleasing and easier to use rather than having a card and using a small wooden cube. The artwork for Tokyo and the Monster characters is simple but effective. The little cubes are a wonderful addition. Their clear plastic see-through look makes them that little bit more special and thanks to them being all the same, there is no need to worry about general currency values. The power cards are also cheap which means they can be bought relatively quickly if the right dice are being rolled. The power cards also deliver an extra dimension to the game meaning that those who want to bide their time to get stronger can, while those who just want to roll point numbers and claws can too. It is also very easy to understand and does not rely on confusion between hit points and defence points when rolling claws, instead just saying you get hit, and how much health you subsequently lose. Additionally, I also like the many references to Monster Movies, many a time I have played this and have gotten into noting the references from the creatures and power cards and just enjoy reliving the memories of watching them. I am also always discovering new things. The power card deck is so big and has so many different cards in it, that every time I play it I am discovering new powers and abilities. I like that. The game though I find does have one little disadvantage. It’s more of a rule that I still don’t understand no matter how many times I have played it; that being the area of Tokyo Bay. Tokyo Bay is used when playing with between 5 and 6 players. The idea is that there is another area of Tokyo, but I don’t understand why it is there, what the advantage of it is, how you get there and how you stay there. I can see the advantage of having two monsters in Tokyo, but this just leads to which monster attacks who when rolling dice. Having a second monster in with more players would also mean two monsters gaining points, but then how does one remain in Tokyo Bay if they are ousted by someone fleeing Tokyo. I just don’t understand the point of having it on the board, and subsequently since, don’t include it when I play it. I also find it hard to understand the part of the rules booklet that explains it. While I do find the inclusion of Tokyo Bay confusing and or somewhat disappointing, it is a minor glitch in what is generally an easy, and very fun game. I just like the idea of being a Giant Monster and fighting for control of Tokyo (like a certain Giant Monster of whom I am a massive fan of). The game’s mechanics of dice rolling are nice and easy to just pick up and play, the character/monster cards are very easy to use and the addition of power cards are easy to understand and acquire (except for the batteries one). The artwork is terrific and the use of the monster stands are brilliant. The designer could have just used the cards as counters, but instead provides the stands to give a third dimension to both look and gameplay. When added to the board the monsters look huge. King of Tokyo is a game I rank among my favourite board games and is one I feel that everyone should try at least once. It’s not just its theme, but also how easy it is to play and how much enjoyment I have always managed to get out of it. I just can’t get enough out of being a Giant Monster and thrashing Tokyo, it’s so much fun.